Western Australian concrete supplier, Multimix Concrete, was the first business in the country to put the brand new New Holland Construction W110B wheel loader to work. Multimix Concrete added the new model to its fleet in response to continued business growth. Richard Joyce, who runs the family-based business with his two sons, Adam and James, and his wife Chris, said having a reliable and powerful loader is at the heart of the operation. 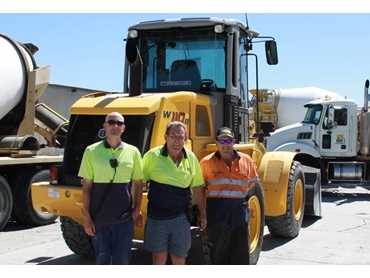 "We supply concrete directly to the end user, working from our base at Bayswater," says Joyce. "Our job is to supply exactly what the customer wants, whether it’s concrete for a local government project or a particular strength concrete to meet a residential or industrial building specification." Joyce says that having a good wheel loader is critical to the business' day to day operations. "Its primary job is to fill our seven cubic metre hopper with a range of aggregates to mix the concrete to the right specification. The W110B is capable of lifting aggregate up to 2,500kg without a problem. In fact, it’s a smaller machine than our other loader, but can easily keep up." A further stand out feature of the new W110B wheel loader is the improved visibility. "We’ve got improved visibility from the cab, making it an easy machine to operate," says Joyce.